With its compound leaves and amazingly exquisite salmon-red trumpet blooms, this vine will bring an exotic flair to your sumer garden. One item to note: this vine is extremely vigorous and tends to spread rapidly so be sure to give it ample room to grow. To slightly slow down growth, plant in somewhat poor soil. 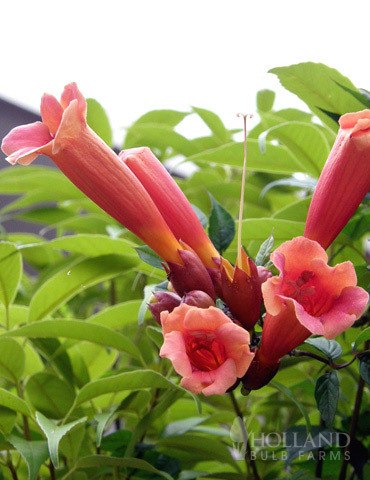 This amazing Trumpet Vine is extremely eager to begin growing in your garden! Attracts hummingbirds! Arrived quickly, very well packaged, sprouted in a couple of days. Very happy with my purchase. Quick procesing time. Product was in good shape. Clear care instructions. Beware of growing this plant!!! It's aggressive/invasive in nature. Once established, it spreads out of control. You will find yourself, for perhaps years, fighting an on-going battle trying to rein in this pest. Look it up before purchasing! There are many other non-aggressive plants to attract hummingbirds.